To reduce costs the Tiger was completely assembled in Great Britain. Rootes placed a first order for 3,000 engines with Ford for the 260 ci engine. At that time Shelby had already replaced this unit with the more powerful 289 ci version in the Cobra. Still, the Tiger and the Cobra were no real competition to each other since the Tiger was offered for a list price of 2,295 US Dollars where the 289 ci Cobra took about 6,000 US Dollars to buy; a huge difference indeed. Where the Cobra remained exotic the more practical, comfortable and affordable Tiger turned into a commercial success, much the way Carroll Shelby had anticipated for his original concept. No need for remorse though since Shelby had negotiated a commission for each Tiger that was sold. The 260 ci (4.2 litre) Tiger was not quite the performer the Cobra had been, but it was quite fast. 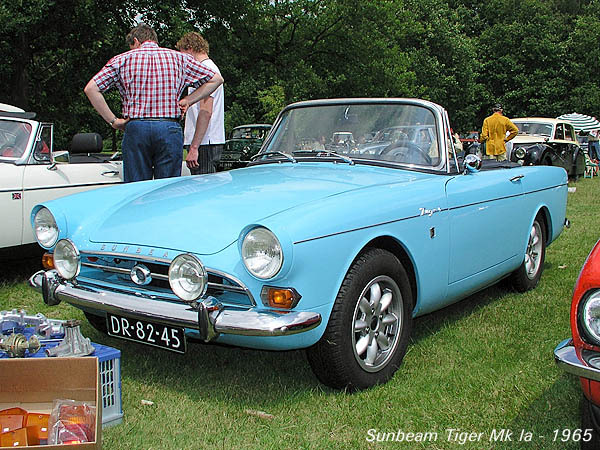 In the Sunbeam the engine produced 164 hp @ 4400 rpm and propelled the 1163 kg car to a top speed of 190 kph and a 0 to 98 kph (60 mph) acceleration in a short 7.8 seconds. This where the only 129 kg lighter Alpine Mk IV had trouble touching 160 kph; a considerable improvement. And for those who wanted to go even faster so-called LAT options were available. LAT stood for Los Angeles Tiger and meant high performance options screened by Carroll Shelby and sold by Sunbeam dealerships. The LAT stage 1 tuning kit for instance added sharper cams, solid valve lifters, heavier valve springs, performance distributor an 4-barrel Holley carbs on Edelbrock F4B manifolds. This way a horsepower output of 245 hp was reached and that gave the car a performance close to that of a Cobra. Other LAT options were alloy wheels, traction bars and scattershields to name a few. To prove the sporting ambitions of the car the Tiger competed in all sorts of racing from the day it appeared on the market. The Rootes Group mainly concentrated on rallying and road racing but in the US the Tiger impressed deeply as a drag racer. From 1965 to 1967 a Tiger driven by Gordon Chittenden held the AHRA national record with an ET of 12.95 seconds and Stan Peterson won the NHRA Class C World Championship in a Tiger with a time of 12.9 seconds in 1965. In Europe Tigers competed at Le Mans with coupe bodies manufactured by Lister in 1964. The cars reached top speeds close to 260 kph, but the engines of both team cars died before the end of the race. 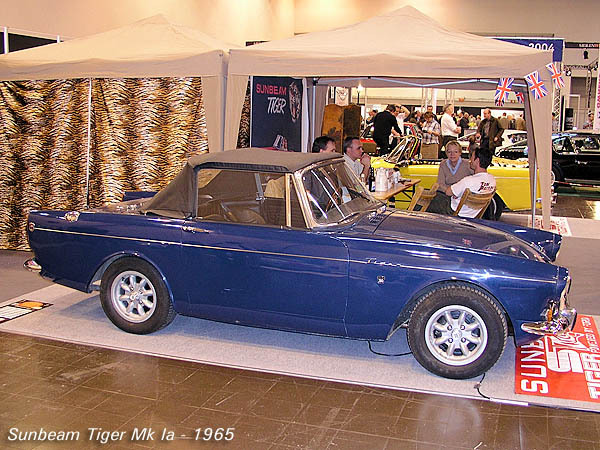 Tigers were more successful in rallies and won their class for instance at the 1964 Geneva rally, the 1965 Monte Carlo Rally and the 1965 Scottish rally. In the US however, its main market, rally victories didn't mean much. There the Tiger was entered in SCCA circuit races, the series where the Cobra roadster and the Shelby Mustang made its name and fame. In 1964 a competition version of the Tiger was constructed by Shelby and Miles and entered that same year with a class B victory at the SCCA Willow Springs race to boost. For the 1965 season the Tiger competition cars were developed and entered by Doane Spencer's Hollywood team, as the Shelby team lacked the time because of other obligations. The team did a great job, winning a number of SCCA races only to loose the class B championship to the new Ford Shelby Mustang GT-350R powered by the 289 ci Hi-Po version of the same engine that propelled the Tiger. Unnecessary to say that the Rootes Group was very unhappy about that. In later years the 1965 SCCA season became known as the epic battle between the Mustangs GT-350R and the Corvettes, which does the Tiger injustice as it was in with a chance. 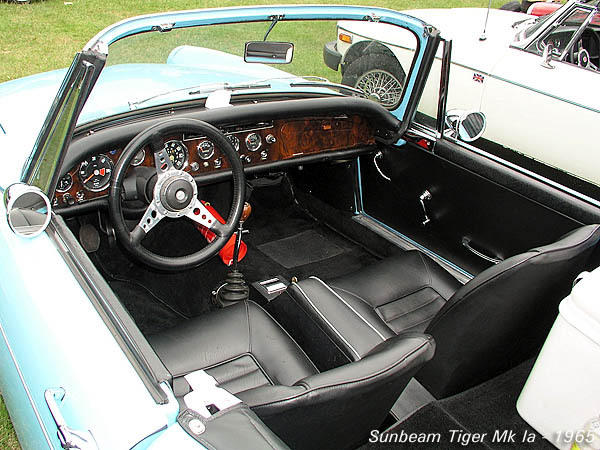 Lost interest by the factory and rule changes made the Tiger less competitive in the SCCA series in the following years, but in all the list with racing successes grew long and impressive. 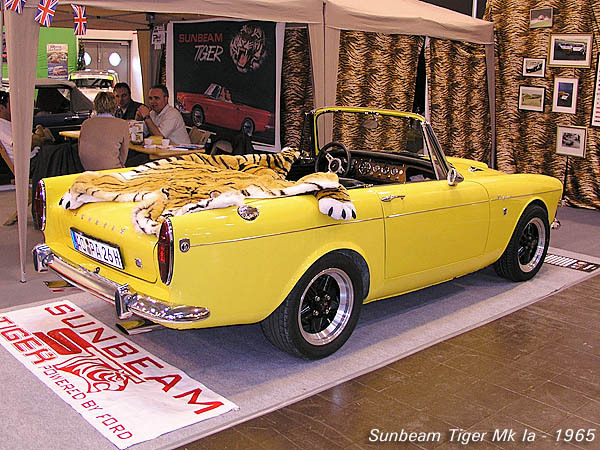 During 1965, about a year after the introduction of the original Tiger, a slightly updated version of the car was taken into production. This version became known as the Mk Ia. The main visible distinction between the Mk I and Mk Ia Tiger is that the Mk I has rounded corners on the lower edges of the doors and on the rear edges of the hood while the Mk Ia has square corners. Other distinctions are a metal convertible top cover on the Mk I where the Mk Ia has a soft vinyl convertible top boot and lead filled body seams on the Mk I where the seams in the body of the Mk Ia are unfilled. Engine and performance remained unchanged.